Jimmy Iovine is one of the few who defined what it means to be a modern music executive and businessman, engineering for the likes of John Lennon and Bruce Springsteen, and co-founding Interscope Records and Beats Electronics. Throughout, his driving desire has been to “move the needle” on popular culture, which he has done in the past by introducing the world to the talents of Dr Dre and Eminem, but more recently, when he and his Beats partner Dr. Dre signed an estimated $3 billion deal with Apple,. Recently, Iovine spoke to Wired for an in-depth profile, including what it takes to effect change. Here’s our take on the valuable insight he had to offer. Artists should always think ahead and see the bigger picture. In order to ensure your development as a leader, figure out what’s next and where the industry is headed rather than focusing on what’s trending. 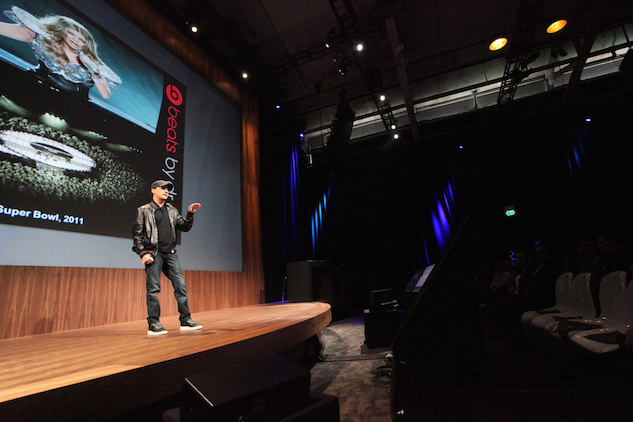 When Iovine had the opportunity to pull strings and invite a huge-name artist to perform at the Apple announcement, he opted to go with The Weeknd, instead of going with the expected Drake or Taylor Swift. His reasoning? “Apple Music is about getting things early and pushing them out,” he said. The song The Weeknd premiered there, “I Can’t Feel My Face,” flew up Billboard charts in the weeks thereafter. Create something that will last. To ensure their legacy of thoughtful art lives on through a “pipeline of professionals” who aren’t just skilled at making music, Iovine and Dre created a program in 2013 at the University of Southern California called the Jimmy Iovine and Andre Young Academy for Arts, Technology and the Business of Innovation. The Academy is structured to breed a new generation of diverse creatives, and, in the past year, over 300 students applied for the program’s 22 spots. If you want to stand the test of time, the future executives of the world must set out to impact culture in a meaningful manner instead of just settling for selling albums. Once you have settled on an end goal, persist with it beyond temporary circumstances. When Iovine originally pit Beats Music (and Farm Club in 1999) against streaming rivals like Spotify and Rdio, his venture didn’t do astounding numbers. But Iovine stuck with it and accomplished his goal, as evidenced by the Apple acquisition. The lesson here: Believe in your product or content, even when no one else does. And if they don’t believe in it, make them believers through your dedication and undeniable work ethic. Assess a current need within the industry and focus on addressing it to separate yourself. Iovine shocked pop culture to its core when he brought Dre and Snoop’s “Nuthin’ But A ‘G’ Thang” to MTV’s primetime slot, where “gangsta rap” had never appeared; as a result, music television was never the same. He continued his trailblazing efforts with Beats, a brand and culture within itself created as an answer to Apple’s cheap audio quality in their earphones. With the Beats technology, Iovine and Dre wanted listeners to really feel the music the way it was intended rather than to just listen along. Never underestimate the power of strong marketing. The packaging of the overall idea is just as important as the product. Iovine upheld this notion with strategic placement of the headphones in the press and on some of pop culture’s biggest icons, even drawing attention from the Bose-friendly NFL. Their restrictions and players’ subsequent rebellion furthered Beats’ popularity. When you provide the public a solid product presented effectively, supporters naturally will push it. Build substantial partnerships and relationships within the business. Always strive to preserve the heart of the culture and stay connected to its pulse.